An indoor library signing with wife Sarah. 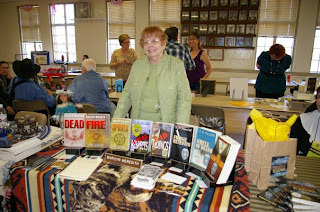 I manned a table at a small rural church's Fall Fest last Saturday, displaying all five of my mysteries. My long-time writers group colleague, Beth Terrell, took part for half of the day, then left for a bookstore signing. This time of year in Nashville usually brings mild weather, with highs in the middle 60s to the 70s. Saturday was an exception. The mercury grudgingly inched into the 50s. A stiff wind blew acres of graying clouds overhead, leaving us huddled in our jackets to keep warm. There were half a dozen other exhibitors, including one with two tents filled with all sorts of bric-a-brac. The sun finally peeked out after noon, but the hoped-for crowds apparently stayed inside and watched football games on the tube. The church was Scottsboro United Methodist, where my wife, Sarah, had attended as a girl, and she enjoyed chatting with old childhood friends. Several of them had already read my books. As it turned out, the day was not a dud because of a simple trick I had learned from somebody on one of the online lists I read. It may have been Rob Walker. The idea is to display your series books in a bundle, which you offer at a discount. I had my four Greg McKenzie books tied together with a ribbon and offered at $45, a 25% discount from retail. Two people, one the Scottsboro pastor, bought book bundles. Other than that, I only sold two books, but the bundles made the day worthwhile. I've done the same at several other selling venues. I highly recommend it if you have several books in a series to market. Without a lot of customers to disturb me, I had lots of time to think about what it means to be a "selling author." Some writers think their job is just to sit at the computer and write. I wouldn't mind doing that, but it would mean all that work produced nothing but words on the screen. I write for the enjoyment of it, but I also enjoy having others read what I write. For that to happen, I must get our there and promote. It's always nice to have someone stop by at a signing and say, "I've read one of your books and really like it." Sure beats those occasional characters who look at the flyers my wife hands out at the bookstore entrance and say, "Who's he? I've never heard of him." I arrived back home tonight from Indy and Bouchercon XL. This was only my third trip to the World Mystery Convention, but as with the others, it was quite an experience. The morning function today was a departure from the past called "The Bazaar." Around 80 authors were lined up in six rows of tables, each with 50 of their backlist books to give away. Registrants received five tickets to swap for books of their choice, and they could buy five more for $5. The space between rows of tables was not enough to accommodate the rush of readers and got quite hectic at times. One of my signing neighbors said, "They've turned loose the hounds." My always raunchy signature got more scrawly toward the end, but it was fun. The only trouble with Bouchercon is you can go four days and never encounter people you intended to seek out. Luckily, Kaye (Barley) from Boone, one of the mainstays from the DorothyL listserve, came by near the end of "The Bazaar" and we got to meet face-to-face. There were several interesting venues for convention events. One was the Thursday Night Extravaganza at Gameworks in the Circle Center Mall. It was a hundred-yard stretch of game machines usually played by kids. Plus buffet tables with the likes of hamburgers and nachos with chicken or beef. With the cold, rainy weather, we were lucky that the Mall and Convention Center (where Michael Connelly was interviewed) could be reached by skywalks from the hotels. Toastmaster S. J. Rozan presented the Anthony Awards at the Hilbert Circle Theater, where the Indianapolis Symphony plays. The various panels and presentations were interesting and informative, at least the ones I attended were. One I really enjoyed was "The MWA Celebrates Adgar Allan Poe," marking the 200th anniversary of Edgar's birth. Michael Connelly, Sue Grafton, Peter Lovesey, John Lutz, and Sara Paretsky bandied about their views on how Poe influenced their writing and the mystery community in general. Though taking issues on several points, all seemed in agreement on the major influence Poe had on the direction of mystery writing right up to the present. My panel, "GEEZER LIT COMES OF AGE, The graying of the genre," was well received. I had a great time discussing the ins and outs of characters "of a certain age" with fellow panelists Mike Befeler (moderator), Naomi Hirahara, Mary Saums, and Patricia Stoltey. One audience member later told me she doubted I was truthful about my age. Actually, she was right. I won't be 84 until next month. My guest today is Marilyn Meredith, the author of two series, the Deputy Tempe Crabtree mystery series and the Rocky Bluff P.D. series. Her latest book in the Crabtree series is Dispel the Mist from Mundania Press, http://www.mundaniapress.com . She lives in the foothills of the Southern Sierra which is located in Central California, a place quite similar to Bear Creek where Deputy Crabtree is the resident deputy. “What am I going to write about this time?” As a writer of a mystery series with characters that are far too real to me to forget about, that question comes up at least twice a year when it is time to begin a new book. While I was researching Kindred Spirits I spent a lot of time in Crescent City with a Tolowa woman who has since become a good friend. She told me stories about Big Foot and his reported appearances in the giant redwoods surrounding the area. Later, when I was writing the book I did some research on the Internet about Big Foot and found a most intriguing reference along with pictures of The Hairy Man. What was more interesting to me was the fact that The Hairy Man resided in my backyard. Of course not literally in my backyard, but in the mountains that I can see from my house and on the Tule River Indian Reservation that is merely a few miles away. What I learned about The Hairy Man is there is a pictograph of him and his family in a rock shelter on the reservation. Of course I was intrigued and had to find out more. The rock shelter is made up of huge boulders, one piled on top of two others forming a cave-like shelter. Inside are the pictographs of The Hairy Man along with his family and other colorful paintings. One of the Indians who lives on the reservation guided us on our tour and pointed out many things in and around the Painted Rock site. He certainly didn’t have to worry about me doing that. Finding the rock shelter in the daytime wasn’t easy, climbing down the huge boulders wouldn’t have been possible for me if I hadn’t had help from the young students. There was no way I would ever go there at night. But my heroine, Tempe, certainly could and would. That was the beginning. From there I created the story of Dispel the Mist and Deputy Tempe Crabtree does go to the Painted Rock at night where her life is threatened and she has an encounter with The Hairy Man. This is one mystery that came from looking in my own backyard. Go to my website http://fictionforyou to read the first chapter of Dispel the Mist. Thank you, Chester for having me visit you today. I know that you look in your own backyard for ideas for your mysteries too. A Tulare County Supervisor, with both Native American and Mexican roots, dies under suspicious circumstances. Because of Deputy Tempe Crabtree’s own ties to the Bear Creek Indian Reservation, she’s asked to help with the investigation. To complicate matters, besides the supervisor’s husband, several others had reason to want the woman dead. Tempe has unsettling dreams, dreams that may predict the future and bring back memories of her grandmother’s stories about the legend of the Hairy Man. Once again, Tempe’s life is threatened and this time, she fears no one will come to her rescue in time. When I began working on the book that eventually became The Surest Poison, I wanted my PI, Sid Chance, to have a female sidekick. I found it advisable to change some of Sid's characteristics as I got into the story, and the lady who became his part-time associate underwent a bit of a metamorphosis as well. Jasmine LeMieux turned out to be an interesting character who has been well liked by readers. My characters develop the same way as my stories. I have a vague notion about them when I begin, but they come to life with all their virtues and foibles as I start writing about them. When the story begins, you learn quickly that Jaz is wealthy. She inherited controlling interest and serves as board chairman for a nationwide chain of truck stops (think Love's, Pilot, or Flying J) headquartered in Nashville. She has a bit of a checkered background brought on by falling out of favor with the family after she quit school to join the Air Force. I wanted her to be attractive (pretty face and shapely figure) but tough. She had been a star basketball player in college and served in the Security Police under a sergeant who had been a Golden Gloves champion. He became her trainer when she went into women's professional boxing after her discharge. Although reaching the pinnacle of that profession, she soon realized that unlike the male sport, women's boxing didn't pay enough to live on. (That was an interesting point I learned while researching the book.) That's when she got a job as a Metro Nashville policewoman. Although she really enjoyed it, she gave up police work to help nurse her father back to health after a serious accident. Her aristocratic mother, the chief architect of her banishment, had died earlier. Jaques LeMieux, a French Canadian import, taught her the ropes of the business, and she went back to school to earn two degrees. Jaz still works out to keep in shape and spends stime at the range occasionally to maintain her firearms proficiency. Oh, and that house up at the top of the blog? LeMieux built a French Colonial mansion in a posh Nashville suburb, where Jaz still lives. 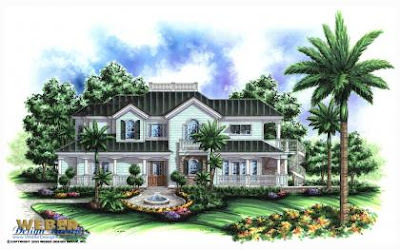 I modeled her home after this one I found by Googling "French Colonial mansion." She still retains a couple, now in their seventies, who had worked for the family since she was a girl. They lived in a small guest house behind the mansion until she convinced them that they should move into the big house. You'll have to read the book to find out how that fits into the story. As for Jaz, she fits the plot like a stylish glove. And she'll continue to emerge in Book 2.